This year’s study on the Reformation has been particularly interested in the context of the events and characters of this time. Many Christians believe that they have a good sense of the period, and that in many ways Luther was much like a modern man and his age much like our own. The Reformation and the person of Martin Luther, however, arose very much out of a premodern context. Luther was a product of his age, as was the Reformation that he helped to spawn. In fact, Luther was a Medieval man. This is not an unimportant issue. For, how we view Luther greatly affects how we interpret him. If we fail to recognize Luther’s context accurately we will impose our own assumptions and biases on him. We will assume his motives parallel our own and we will, often, reduce the Reformation to simplistic and anachronistic explanations. For example, while we may think very little of divisions within the church today, the notion of separating from the established church would have been inconceivable to the people of Luther’s age. Today, if you don’t like the music or the preaching, if you’re disappointed in the youth program, or bothered by the color of the carpet, then you can simply leave your church and go to another. In the Middle Ages, however, it was unimaginable for the average person to think about leaving the church. We may, of course, rightly acknowledge the division that existed between the Eastern and the Western churches, but still this was a rare exception. The church was at the center of life and from the perspective of the whole of the Roman Empire, she held the keys to spiritual life! To leave the church was to court eternal damnation! It’s important, then, that we not think of Luther in terms of a radical, a rebellious son of the Church who is ready to relaunch the faith due to corruption from within. This is a completely modern notion and a faulty interpretation of the man and his time. For the bulk of the period the scholars and preachers involved in the debate are seeking to resolve the disagreements in a way that maintains the unity of the Church. No one foresaw the complete division that was to come, and no one would have wished for it. 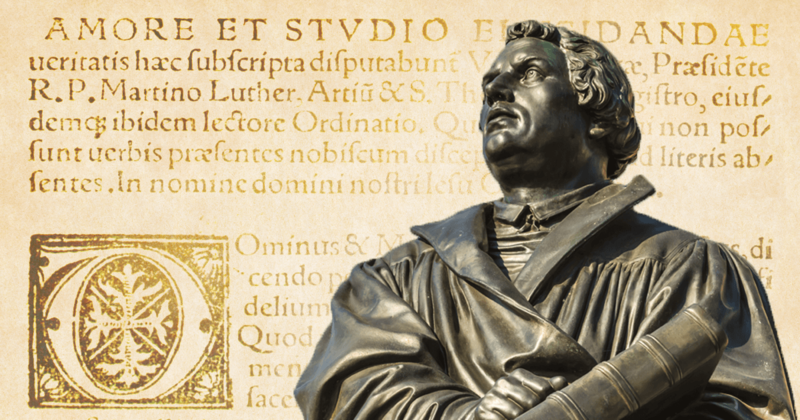 Luther is distinct among the Protestant reformers in several key ways. One major distinction between him and the latter reformers is seen in his relationship to Humanism. Calvin and Zwingli were trained as Humanists and greatly influenced by that philosophical landscape. Luther, however, was trained in the Medieval schools and while he utilizes the benefits of Humanism, he has very little sympathy for it. Certainly, he was influenced by the “return to the source,” which Humanism proclaimed. He taught and lectured particularly on Augustine, and referenced many of the early Church Fathers whose works had all seen renewed interests because of Humanism. His use of a Greek New Testament was a direct result of Humanism. And while many significant Humanists (like Desiderius Erasmus) praised Luther in the beginning, Luther was not a Humanist. Luther was still very much a medieval man, and his interests were not in the modern movement of progressive forces. His interests were still very much tied to church, to the past, to theology over politics. While Luther was surely very radical in some of his theological points, we must note also that he maintained a much closer affinity to various elements of the Medieval world than his successors would. He was not as dramatic in his departures from Rome as latter Protestants and Humanists were. One can note the difference, for example, between sacramentalism in the Reformed tradition and the High Sacramentalism in Luther’s teaching. The two camps were unable to unite Protestantism precisely because of their views on the Lord’s Supper. Zwingli, Luther said, was of a “different spirit” because of this disagreement. He was also something of a superstitious man, raised in the Medieval world of spooks and spirits. He wrestled with the devil in nearly physical battles, throwing his dishes at him and engaging in yelling matches with Satan. He lived in a world haunted by the demonic and saw the presence of such forces everywhere. Such notions were very premodern, and more akin to Medieval theology than to latter Protestant teaching. Finally, we may note that Luther was not truly innovative in his theology. Many of his major theological points were developed over time and were drawn from those who had gone before him. In fact, as early as 1519 Luther was compared to Jan Huss (the Bohemian reformer of the early 1400s), and he himself admitted to agreeing with some of Huss’s teachings. Luther was, of course, in many respects of a student of Augustine and he referred to the Anti-Pelagian teachings often, but even here he was influenced by certain Medieval interpreters of Augustine. In addition, his criticisms of the papacy, and priesthood, of the Eucharist, and man’s participation in grace were each respectively articulated by others before him. His articulation of Scriptural supremacy and authority was being argued centuries before Luther emerged onto the theological scene. To what degree he was directly influenced by these other voices we cannot precisely say, but there is no sense in which these doctrinal challenges emerged brand new in Luther. He was a product of the time and the changing landscape itself. Luther was a Medieval man and this matters for students of history. Reading him within his own time allows us to more accurately understand him and his time. The simplistic understandings of Luther and the Reformation that abound in popular theology do not help us to appreciate all that God had been doing in the age. In fact, the simplistic explanations do not even allow us to appreciate Luther’s reform, for when we see the influence his own age had on him we realize just how far he came in the Reformation. Luther was a Medieval man, but he was a man growing and reshaping his thought. He was a Medieval man no longer at home in the Medieval world.